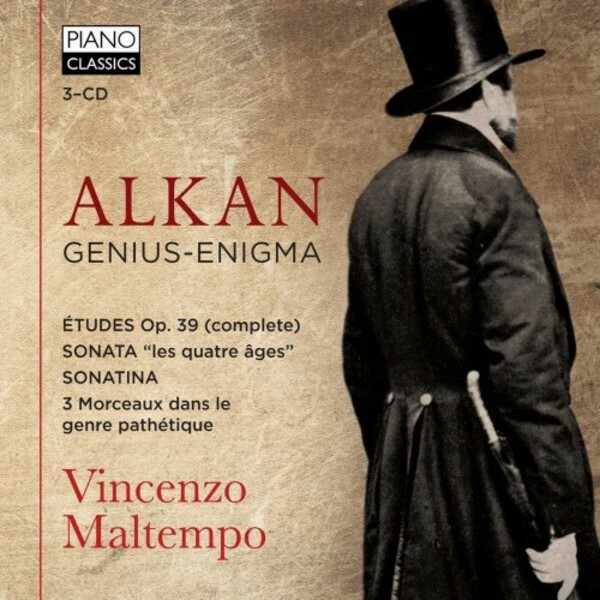 This 3 CD set contains the major cyclical works by Alkan: the complete Études dans tous les tons mineurs Op.39, the Sonata 'Les quatre âges' and the Sonatina. These towering works, of unprecedented proportions, difficulty and originality, form a landmark of 19th century pianism, only comparable with Liszt’s compositions in these genres. Alkan’s deep musicality and humanity lift these works from mere curiosities (or monstrosities..) to genuine and universal works of art. This set is a reissue of 3 previously released CDs, all played by young Italian Vincenzo Maltempo. Their release caused a true sensation: “exhilarating, a revelation!“ (Guardian, selected among the 10 best CDs of 2012), “his playing flashes with summer lightning” (Gramophone), “Maltempo puts his phenomenal technique at the service of his poetic vision” (Piano News), “with this passionate performance Maltempo confirms his place in the restricted circle of Alkan’s best performers” (5 star, Diapason), and many more.